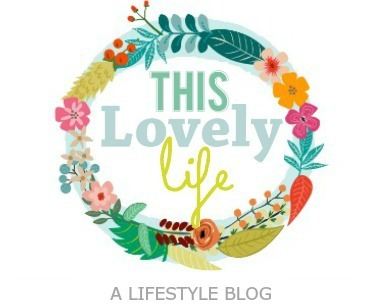 I am so excited to share with you this fun project! I love quirky things. I also kill plants regularly. I have a black thumb. I even managed to kill the three beautiful succulents I got as a wedding favor with a tag that read "Let Love Grow"... I let love die. Here we are at the solution to my problem. 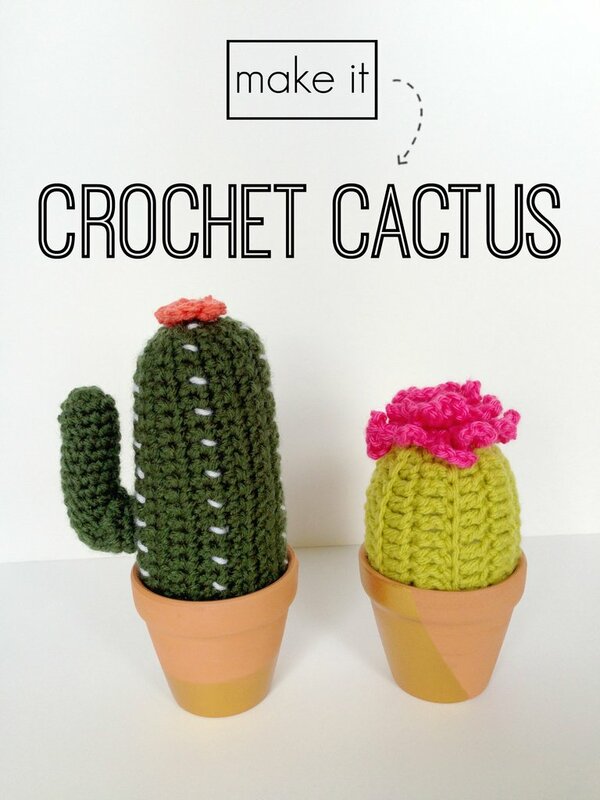 Crochet cactus'! Why not right? Below you will find the pattern for these two cacti and I am working on a couple more varieties as we speak! R2-28: Sc across in BLO, chaining 1 and turning at the end of each row. Fold in half and SS the long side together. Using your tapestry needle, run some yarn around one open end. Pull tight like a drawstring. Tie a couple knots to secure. Turn right side out and stuff till mostly firm. Drawstring the other end closed. R10-15: Sc 5, ss 5. It will get thick where the ss are, that's the way you want it. R16-17: Once you have a right angle, continue with only sc. Tie off and use tail to attach to cactus with needle. 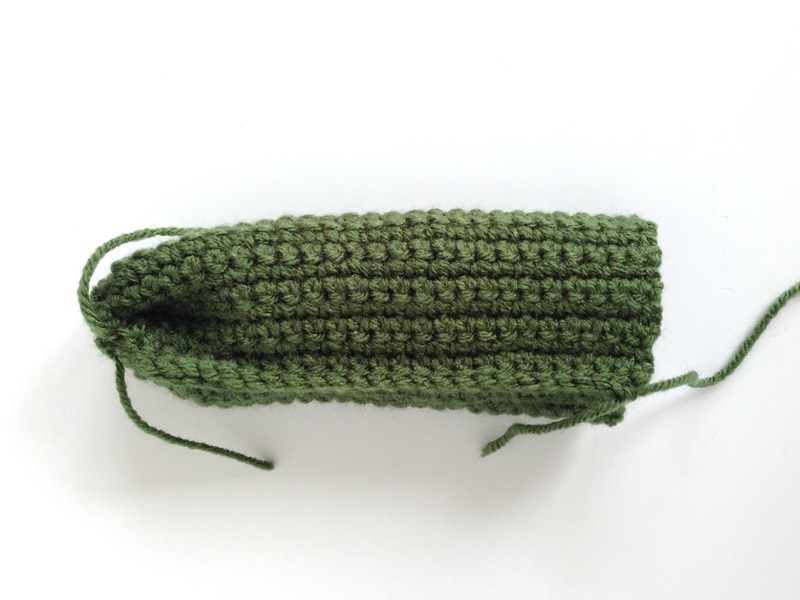 Using a tapestry needle and white yarn, locate the "ribs" going up the sides of the cactus. Whip stitch around them all the way to the top then back down another "rib". Make sure they are evenly spaced. Tie off as base of cactus. Ch 4 and ss closed to form a circle. Repeat * for 4 or 5 petals. Tie off and use tail to attach to top of cactus. R1: Dc in 2nd ch from hook. Dc across. Ch 2 and turn. R2-13: Dc across in BLO. Fold in half and ss long side together. Drawstring close one end like you did before. Turn right side out. Stuff then close the other end. R1: Sc 12 into magic circle. Pull tight. R2: *Ch 11 and ss in next stitch*. Repeat * for 12 petals. R1: Sc 6 into magic circle. Pull tight. R2: *Ch 8 and ss in next*. Repeat * for 6 petals. Tie off. Stitch both flower pieces to top of cactus. Attaching cactus into pot using hot glue. You made me laugh ... my daughter, too, killed live plants. Her younger brother thought she couldn't kill fabric plants he saw at a craft show - and bought for her. She loved his gift! Alas, so did her dog. Dead fabric plants, too. Great Pyrenees and the plant had no chance. OMG SO CUTE. I honestly love these mini cactii! Too bad I am not talented enough to knit them myself, do you have an etsy store or something?